When I have a friend come in from out of town they ask me about the variety of sandwiches always available at Cuban restaurants and cafeterias. 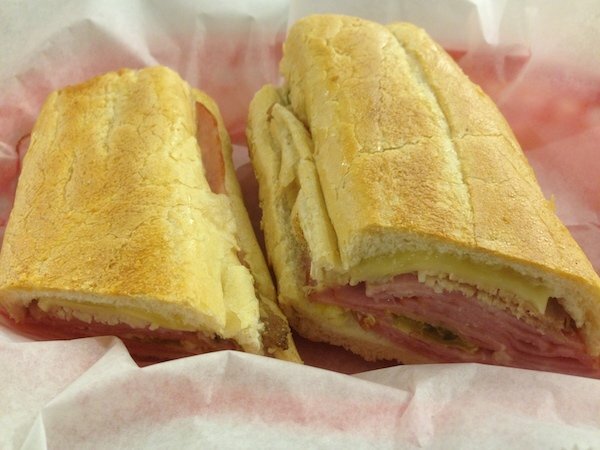 There is always an extensive sandwich selection at 99% of Cuban places. I grew up around this and have never really given it a second thought. It’s easy for me to zero in and order but I can imagine it’s overwhelming when you don’t know what these sandwiches are, and not speaking Spanish doesn’t help. How to know when you’re in the right spot for sandwiches? They have a dedicated and visible to the public sandwich station where all the magic happens. The number of questions I get on this topic made me think, I should do something. So here it is, a guide to help and educate folks a little about the more popular sandwiches on the Cuban restaurant menus across Miami. It’s almost like a dummies guide but since this is Miami, it’s for mongos. This is going to be the most obvious and known sandwich on this list. It includes Sweet Ham, Roast Pork, Swiss Cheese on a Toasted Cuban Bread with Mustard and Pickles. This sandwich must be pressed to get that important crunch on the outside of the bread. If you’re in Tampa, Salami is also part of the equation. 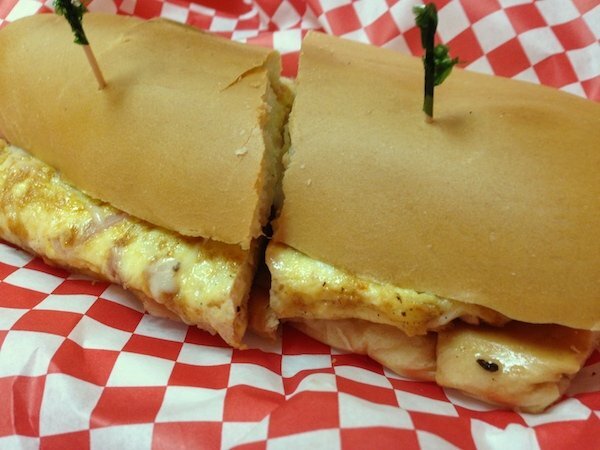 What’s so “Especial” about this Cuban Sandwich? Well, it’s a larger version of the Cuban Sandwich and it’s for those of you who can’t get enough of a Cuban Sandwich but don’t want to order two. You’ve had the Cuban Sandwich and want something similar but yet different. I get you, you need a Medianoche in your life. Same ingredients BUT on a sweet egg dough bread, my personal favorite. Medianoche translates to Midnight and this guy is the perfect midnight snack. I’m gonna have to agree and say, yes this does look ridiculous. How can a cracker withstand the weight of all of those ingredients (Roast Pork, Sweet Ham & Swiss Cheese)? The answer? Don’t count out Cuban Sandwich Physics which breaks all the rules. The name Galleta Preparada translates to Prepared Cracker in case you were wondering. You will find different variations of this around town. Normally Sweet Ham, Swiss Cheese and Ham Croquettes on Cuban Bread make up the Croqueta Preparada BUT you may find Roasted Pork, a different kind of Cheese, Mustard, Pickles, different Croquetas, different sized Bread, Julienne Potatoes, and Medianoche Bread in some places. My personal favorite is Ham, Swiss Cheese, Ham Croquetas & Mustard on a Medianoche Roll. 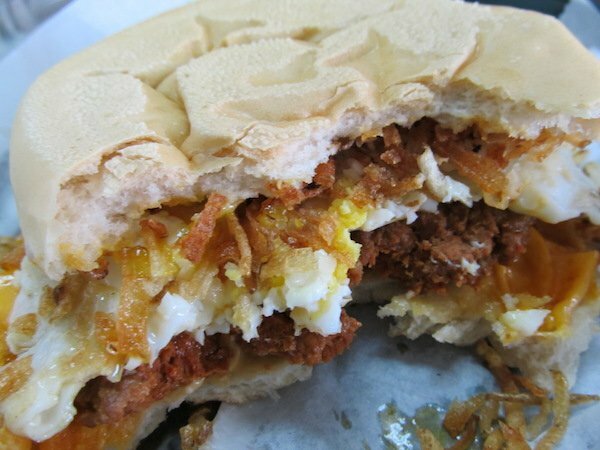 Most Frita Joints have killer versions of this sandwich. 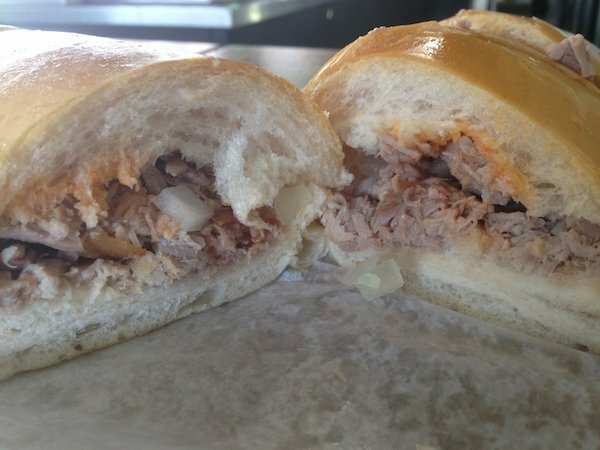 It is also known as the Calle Ocho Sandwich by Versailles & La Carreta restaurants. It’s Ham, Turkey, Bacon, Lettuce, Tomato, Swiss Cheese & Mayo on Cuban bread. I have mine without the Lettuce and Tomato. This sandwich is as good as it sounds. Right off the bat let’s correct a problem I see on many restaurant menus it’s Elena Ruz NOT Elena Ruth. 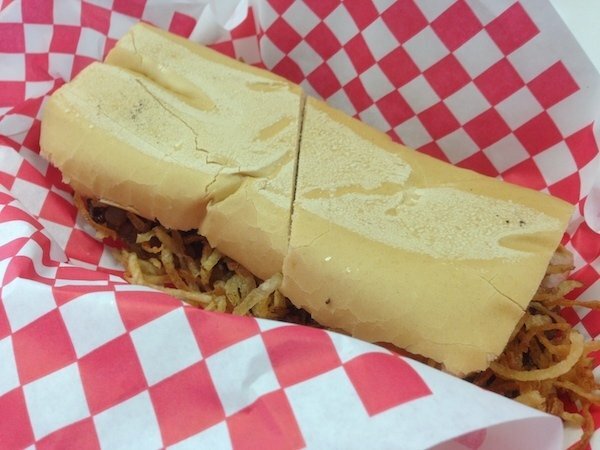 You can read about old school Cuban socialite Elena Ruz, the creator of this sandwich here. The original version is Cream Cheese, Strawberry Jam, slices of Turkey on Medianoche Bread. The variations I’ve found are in the bread where the Medianoche Bread is replaced for White or Cuban Bread. The Pan con Minuta is most easily described as a fried Snapper sandwich. Pan is Bread, Con means with and Minuta refers to how they cut the fish during preparation, it’s a butterfly cut. 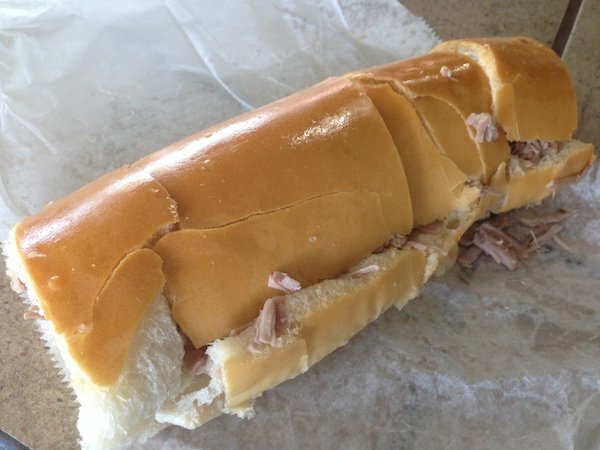 The sandwich still has its tail attached and it adds to the integrity of the sandwich. I’m gonna go out on a limb here and say that some people eat the tail (actually I know they do). Pan con Tortilla or Omelette Sandwiches are generally not pressed. Most spots will have you add the ingredients you like to the omelet. The standard being Ham, Swiss Cheese, and Onions but may also include Peppers, Potatoes, and Chorizo. All are good options and you need to find what the right combination is for you. Pan con Bistec is a Steak Sandwich and its preparation varies from restaurant to “Ventanitas“. The common prep is with Grilled Onions, Lettuce, Tomato. You will find Ketchup, Julienne Potatoes or Potato Sticks and Mayo added while others are removed. I personally dig the Grilled Onions, Julienne Potatoes and Mayo combination if you can find it. 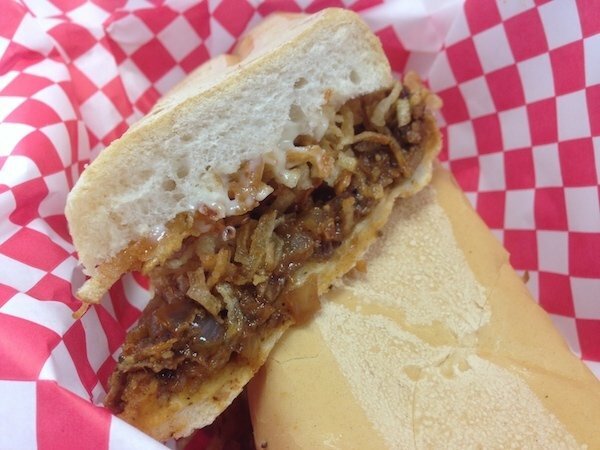 My standard Frita Cubana explanation: It’s a mix of ground beef (sometimes Chorizo or pork is added) , seasonings (paprika for sure), julienne cut potatoes or potato sticks, diced raw onions and ketchup (rumored to be tomato paste not ketchup in Cuba) on a Cuban roll. It’s cooked on a flat top and not grilled over an open flame. A bunch has changed since I wrote that almost six years and Chefs are now running wild with their own interpretations. 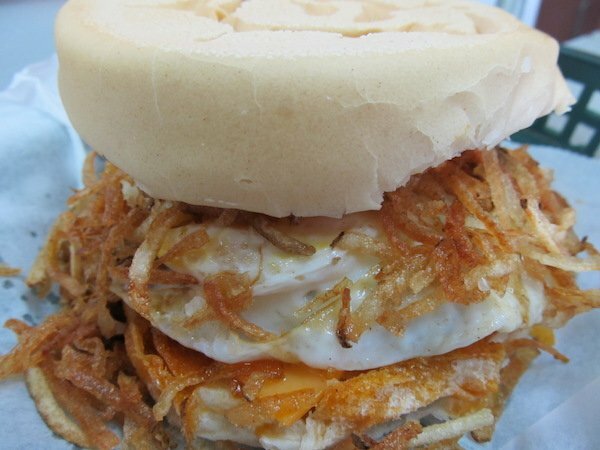 To eat a great Frita check out my Top 10 Fritas in Miami list. Do not eat them at Cuban Pizza places, 9 times out of 10 they are horrible. The one pictured is served on a Potato Roll, still very excelente. 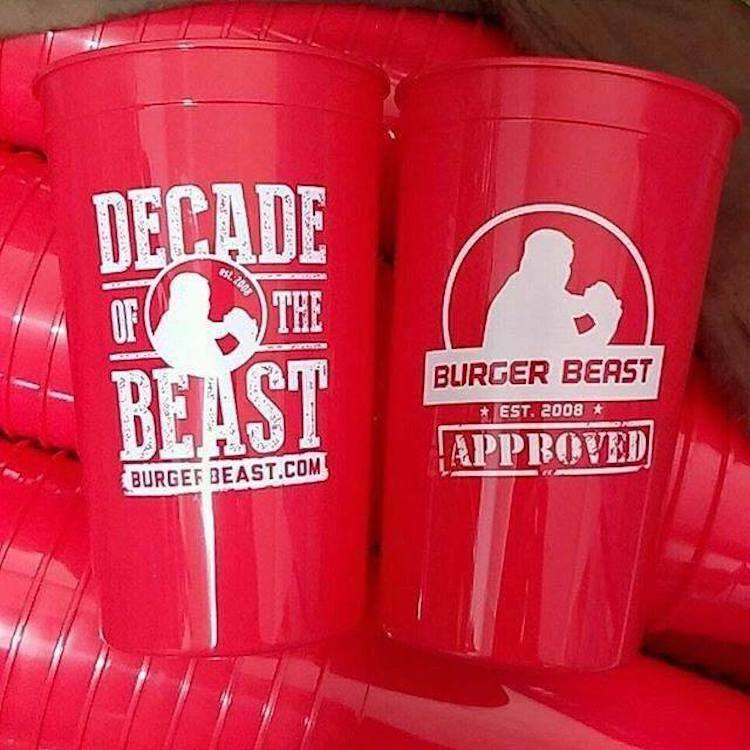 You may not see it on the menu so it’s almost like a secret menu item addition. If you ever see “a Caballo” on a menu, it means the addition of a Fried Egg to the dish. You never say “No” to a Caballo, got it? What is the translation of “Caballo”? Horse. How does this make any sense? Beats me, I eat and try not to ask many questions. I gained weight just reading. All of them look really good. Thanks for sharing! I hope you walked away with some new obsessions. Are there any condiments on a typical Pan con Tortilla? No but a few spots might ask if you’d like Mayo on it. It’s called “A Caballo” because the egg is “riding” on top of whatever the dish is.